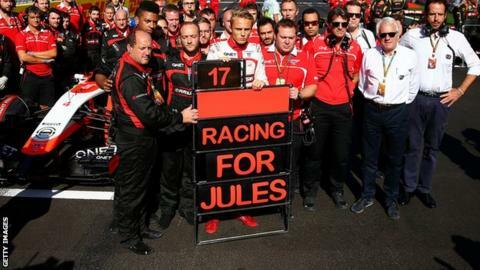 Formula 1 driver Jules Bianchi's fight to recover from injuries sustained in a crash last year is the equivalent of "running a marathon every day", according to his father. Bianchi, 25, remains in a coma, six months after the accident in Japan. "The only thing we can say is that he's fiercely fighting as he always did, before and after the accident," Philippe Bianchi said. "From a medical point of view, his condition is stable." The Marussia driver crashed into a recovery vehicle at the Japanese Grand Prix at Suzuka. He sustained a severe head injury and is now under the care of neurosurgeons in his native Nice. His father, speaking to French newspaper Nice-Matin, added: "Our universe collapsed on 5 October 2014. "I think that in this type of accident it shocks more than an actual death. The pain is endless - a daily torture. "Every day, Jules is running a marathon. All of his organs are working without assistance. But, for now, he remains unconscious. "He's moving forward. So we hope for a new evolution. The next one would be for him to get out of his coma."